Random ramblings from a perfectly average girl! If you look at a Christmas tree, the first thing you notice are inevitably the lights and the tinsel. You can’t help it – those are the shiny, bright, and often nostalgic elements of the tree. They are the things that enhance the everyday evergreen. The most important lesson I have learned in all of the trials and tribulations in the last 2 years: I am the Christmas tree and my friends and family are the ornaments and the tinsel and the lights. I am my own sturdy foundation and my loved ones are the wonderful sparkles that define me. If I didn’t have the caring, supportive, and giving people in my life to keep things sparkling, I would be simply a tree in the corner – but with my tinsel and twinkle lights, I am special. With my family and friends, the wonderful people who have supported me and helped me dream big dreams, my sturdy evergreen can shine! So, to all of the people in my life that I love so very much and who truly are the lights of my life, I wish you the very Merriest Christmas and a VERY Happy New Year! This time of year, you can’t travel 5 feet in a store or mall without seeing a vision of Santa Claus. He has become the commercial face of a holiday that was originally supposed to be a birthday celebration for our Lord. I don’t, in general, have a problem with Santa – I think he represents all the magic and wonder of believing in the spirit of Christmas. I, however, would like to remind myself of the “Reason for the Season,” the true meaning behind Christmas – the arrival of our Lord in the form of a small, innocent, human child who would pay dearly for our sins and who was the fulfillment of a prophecy for a Savior. I think that I have always, in forming my religious beliefs, used that small baby as the foundation for what I believe – not a wrathful vengeful God but one who would deliver a loving Messiah in a dirty stable surrounded by animals and wrapped in cloths. Every time I think of the Christmas story (which, just as an aside, is told in an amazingly touching fashion by Linus in the Charlie Brown Christmas), I see in my head the nativity set. 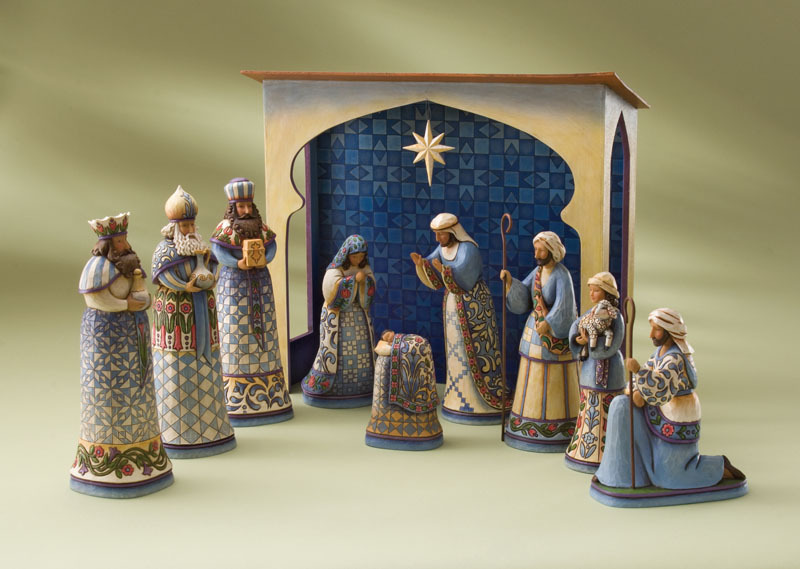 Growing up, my church had a set that would start as a simple stable and, each week throughout the advent season, would add a different element to the story until Christmas Eve when the babe would appear in the manger. 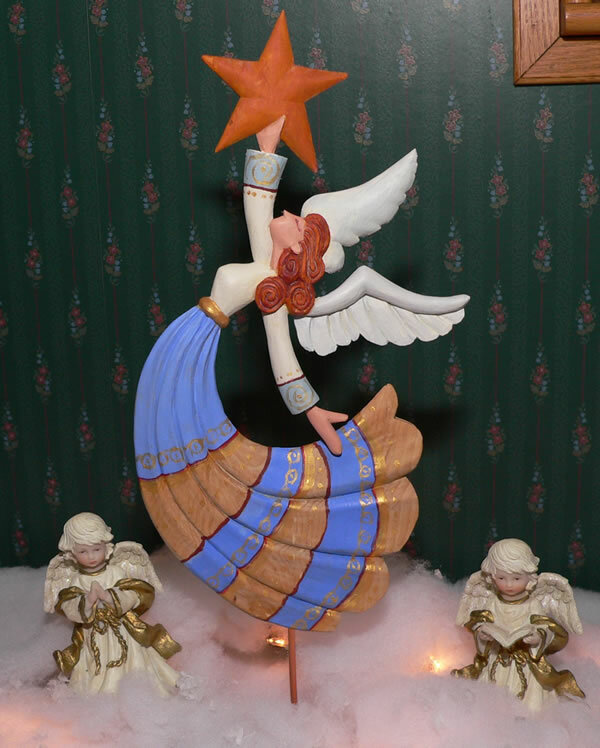 Those simple statues created the most meaningful memories I have of the nativity story – statues that brought a magical story to life and reminded us WHY we celebrate that night! We also had a nativity set at the house (which survives to this day) and I now have one for my home. I leave mine up year-round, though, perched serenely on top of my grandmother’s piano, reminding me daily of my duties and my privileges of being a Christian. I think the nativity set is a dying breed of Christmas decoration. No longer can you find it on the shelves of most stores – you have to look for a specialty store. And, while I am glad that collectible companies are jumping on the spiritual bandwagon , do we really need a Disney Mickey & Minnie nativity set? But, for me, those figures of wisemen, angels, shepherds, and the holy family (regardless of how they are dressed, what color they are, or how garishly they are decorated) will always represent what Christmas is about – a loving family, a loving God, a loving tradition! What movie defines your holiday traditions? What cinematic adventure is a must in your family Christmas season? We all have them, even the Scrooges and Grinches in the group. Maybe a few tears are shed when George Bailey hears the bell ring in “It’s A Wonderful Life” or Scrooge discovers the Christmas spirit in “A Christmas Carol.” Maybe you can’t help but laugh at Cousin Eddie in “National Lampoon’s Christmas Vacation” or at Buddy the Elf’s antics in “Elf.” Maybe the sweet innocence of Cindy Lou Who in “How the Grinch Stole Christmas” or Susan in “Miracle on 34th Street” inspires you to just believe for a while. Or perhaps the classic songs of “White Christmas” or the iconic moments of Ralphie’s life in “A Christmas Story” bring back the nostalgia of Christmases past. Whatever your favorites are, the holiday movies create special times for us. The most important part of these movies is the family time together that they create. Friends and family gathered around a screen laughing, crying, and creating traditions and happy holiday memories! 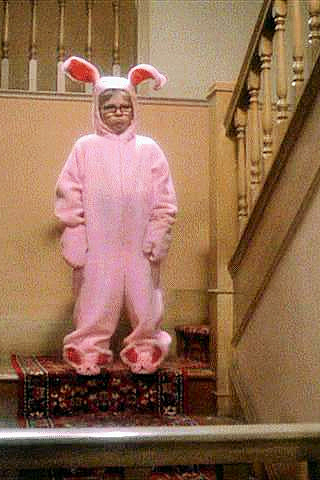 I’m happy to report that we have introduced my godson, Bryce, to the joys of Christmas movies last year – we had a pizza dinner and watched MY favorite – “A Christmas Story.” What a wonderful memory I will take away from this difficult holiday season – and all because Ralphie was willing to don the pink bunny suit just one more time to make a little boy giggle. I wish you all a few laughs and a few tears courtesy of Hollywood as we near Christmas Day. May George Bailey inspire you, may Scrooge not be you, may Buddy remind you of the childish joy of the season…. The star atop the tree symbolizes the Star of Bethlehem, leading shepherds and kings alike to the Baby Jesus. How wonderful it is that a bright blazing symbol still sits atop our trees, reminding us of the way back to Jesus. My parents’ tree has had the same blue and silver foil star for at least the last 30 years so, when I started my own tree tradition here in Maryland, I selected a star to sit atop the tree. But, now that I have gotten older, I am going to add an angel to sit prominently near the top. I don’t know why but I have always been fascinated most by the angelic element of the Christmas story. I’d like to believe that I have angels all around me, guiding me through this tricky world. I know some of you out there must be thinking I’ve lost my mind and will next be talking about ghosts and voodoo priestesses – but I absolutely believe in angels! I think that the people we’ve lost, loved ones and friends, keep an eye on us and help to protect and shield us. And, I am SURE that someone up there is helping me navigate. One of my all-time favorite Christmas movies is It’s A Wonderful Life. George Bailey’s guardian angel, Clarence, shows him how valuable he is to the world, to his family, to his friends, and to his town. How amazing is a God that can send an emissary to prove our worth to ourselves! So many of us have lost someone we truly loved – and I ‘d like to believe that God simply needed them in heaven more than we do. He needs their help as friends for those in heaven and as angels for us on earth. So, I will add an angel to my Christmas tree, as a tip of the hat to my angels up there who are guiding me! I had to go to wikipedia to find out about the history behind kissing under the mistletoe. Although it has only been linked to Christmas since the 18th century, mistletoe was originally a pagan symbol for “divine male essence.” Ha, as if that even exists. It was often left in houses all year long as a protection against lightning and fires. 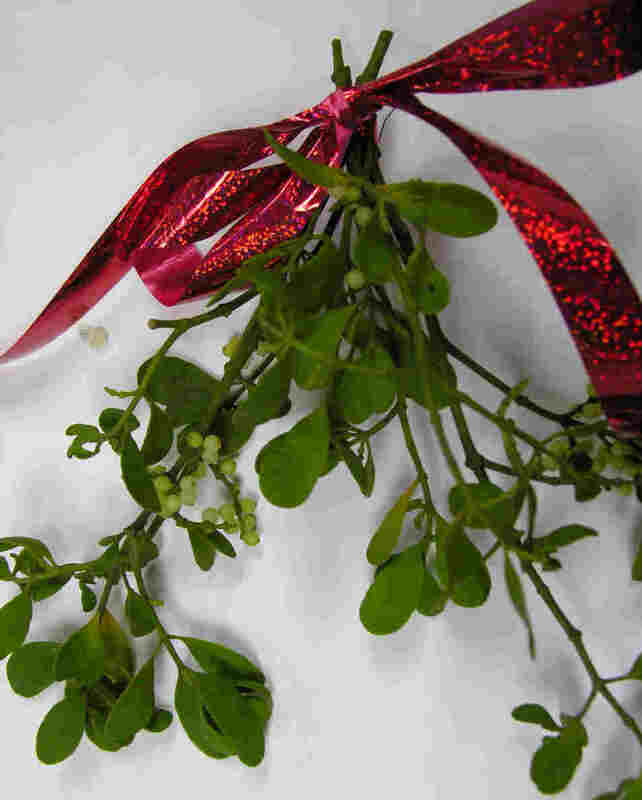 The Christmas custom, thought to have started in Scandinavia, is that any two people who meet under the hanging bunch of mistletoe during the advent season were obliged to kiss. Interestingly, the actual plant is poisonous – kind of like kissing the wrong person. I have discovered that I have kissed a lot of frogs, especially here lately. I have to wake up every morning and face the simple truth that I have repeatedly handed over my heart to people who don’t treasure it the way they should! I believed in the silly myth of fairy tales and true love – and yet I think I shall continue to believe. In the true spirit of mistletoe, I’m going to keep looking for a man who will treat me well, respect me, and want to kiss me every Christmas for the rest of my life! I know, I know, many of you are scratching your heads and wondering what the heck I’m rambling about now. The Yule Log? Huh? 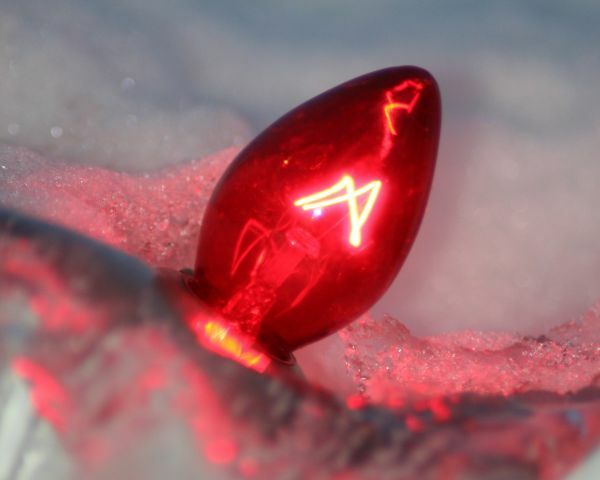 This is perhaps the most obscure symbol of the holidays that I will write about this season. Again I had to hit wikipedia to find out where this tradition had originated. The Yule log was originally an entire tree, that was carefully chosen and brought into the house with great ceremony with the purpose being to provide maximum warmth and endurance. In British households, the fire used to burn the log was always started with a remnant from the log that had been burned in the previous year’s festivities. 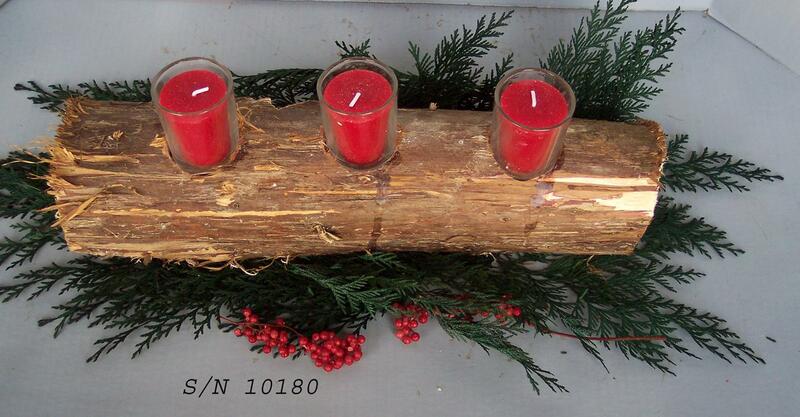 In our household growing up, the Yule log sat as the centerpiece to the Christmas Eve and Christmas Day meals. The log had been cut from the very first Christmas tree that my parents had together as a married couple. The log was layered with years of burnt wax and yet I can’t help but think that it is one of the most beautiful Christmas symbols I can think of. Not only does it represent the long and happy marriage that my parents have enjoyed, it represents a certain continuity of tradition. That log is a tangible reminder of the loving family that I come from and my British heritage – and it holds 3 candles that will, this year, remind me to burn bright! All too often, we lose ourselves in the “trappings” of Christmas – what gifts to buy? which party to attend? what to make for the office holiday party? Yet, to me, the holidays should be about more than just STUFF – they should be about WHO you’re with and where you come from. The holidays define us – the continuity of our families, our traditions, and our relationships. So, look around you this season and select something that reminds you of where you come from and who you love. I challenge you all to pick something that defines YOU and celebrates who YOU are and where YOU are going! Christmas 2011 – Roast Beef, Yorkshire Pudding, Mashed Potatoes, Green Peas, Red Jell-o…. This is NOT the menu from some fancy restaurant – this is the menu for my family’s traditional Christmas Eve dinner. It has not changed one iota since in the last 31 years and I truly don’t expect it to now. And even though my eating habits have massively changed in the last 2 months, I still plan to sample most of this traditional meal – in honor of the family heritage and the family tradition. I think it started with my grandmother Hallings, who was British by family lineage. 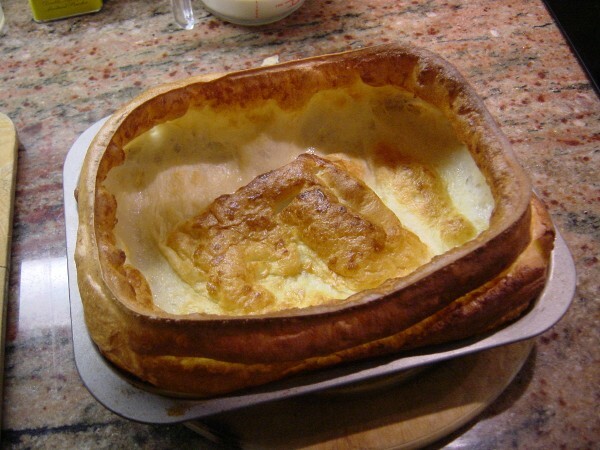 For those of you uninformed about the joys of a Yorkshire pudding, it is a dish similar to a popover made with the drippings from a standing rib roast of beef. Very thrifty folks, those Brits, using every drop of goodness. My mother, one of the great ladies of the world, busts her hump every year to produce this dinner in addition to Christmas Day breakfast, church commitments, and last-minute wrapping. This year will be even more of a challenge for her as she worries about my new eating habits and whether I can enjoy as I always have. I admire my mom for always working so tirelessly to produce a wonderful Christmas tradition for her children! So why is this menu so special to me? Why would I be heartbroken should my mother ever decide to switch to a turkey or a ham? Because family tradition is the most important thing I have! Friends and spouses may leave, years may pass, and I may get older – but I know that one dinner a year is going to remain a constant fixture in my life.